My new KOrganizer showing my old appointments. I’m running Debian Sid, because I like to have a rolling distribution with the latest and greatest software as soon as it is released. 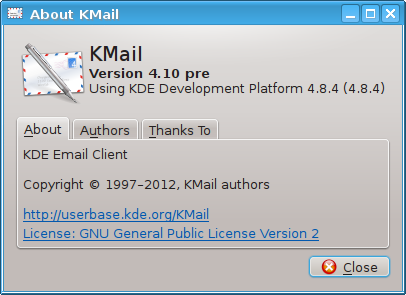 Unfortunately, the KDE packagers in Debian lack (wo)men power and still ship 4 year old KDE PIM packages. Using their experimental KDE repository does not help. Since I have multiple annoying issues with Kontact 4.4.11 and because I need it functional for work, I decided to take a rather extreme step: Compiling it myself from the source code repositories. Turns out that it isn’t all that difficult. I documented the process below for those who want to follow my example. It enables me to stay up to date with the development whenever I want and I receive bug fixes immediately after they have been pushed without having to wait for them to be packaged for my distribution. Also, in case I want something to be fixed that still isn’t in latest master, I can just do it myself now. 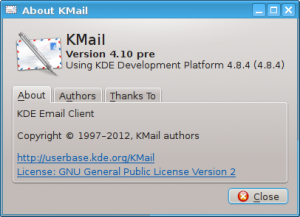 In order to get started I read KDE techbase which is quite a good resource even though it could still be improved. At first I had to add the following to my ~/.gitconfig file. While I was trying to make everything compile without error, I needed to install the following packages. Please note that on your system you might need additional packages like build-essentials which I already had installed. Finding out which package is missing is quite easy from the cmake output. The techbase told me to have some environment variables set, so I added this to my ~/.bashrc file. Then I sourced the file, to have the changes right away. Of course I created /opt/kde and gave my user the necessary rights to write into this directory. Then for each repository I cloned before, I changed into the directory of the repository and executed the following commands. In rare cases I got an error which I fixed by either installing a missing package or by editing some file. For example, in strigi/strigidaemon/bin/daemon/eventlistener/eventlistenerqueue.cpp I had to add #include <unistd.h> in the beginning for it to build. 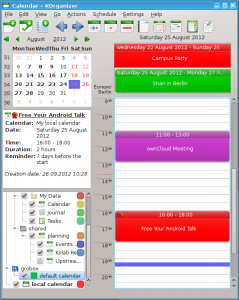 Once everything was build and installed, I removed my KDE PIM applications from Debian to be sure there are no conflicts. I couldn’t remove akonadi or some libraries because of dependencies. In the #kontact IRC channel I was told to execute the following command which allowed me to have access to the settings in the newly build applications. After this is done, I would suggest a restart to be sure that no old libraries are loaded or old Akonadi is running. 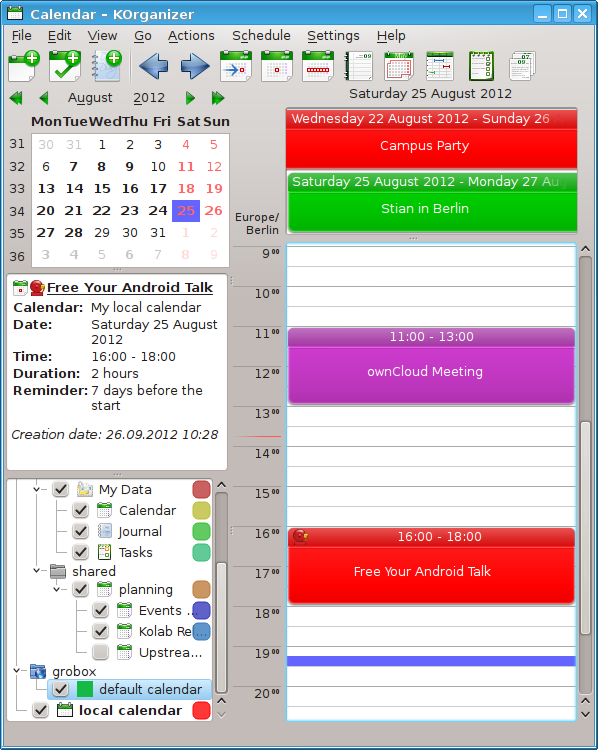 Then you can start your new KDE PIM applications and enjoy them. I’m really impressed by the progress done over the last few years and especially enjoy IMAP idle for Inbox folders and the ability to run all PIM applications independent from each other. Kontact really is a professional full-fledged groupware client. Have fun with your brand new PIM applications and consider contributing if you find the time!